Childhood is a period of learning the ways of life, for parents and children alike. Health of young children is more vulnerable in comparison to adults. This happens because they have not developed a strong immunity yet. This makes them more likely to fall ill with allergies, infections etc. Illness stimulates the immune system to develop a healthy defence against various harmful influences. However, this does not imply that diseases should be allowed to run rampant. It is necessary to protect young children from developing disorders which could compromise their health on a permanent basis. Defending their health from harmful disorders is most important. The first step towards this is providing proper vaccination to babies right from birth. The National Immunization Schedule is a venture initiated by the health ministry. This schedule provides a detailed chart of all vaccinations required from birth till the age of 18 years. The name of vaccine, diseases it helps to fight against, mode of administration and the age at which each vaccine should be administered, are some details mentioned in this chart. Timely vaccination is one of the best ways to develop a strong immunity. Several vaccines are administered to children from birth till the age of 18 years. These vaccines have to be given at a specific age only, to have the desired effect on the child’s immune system. 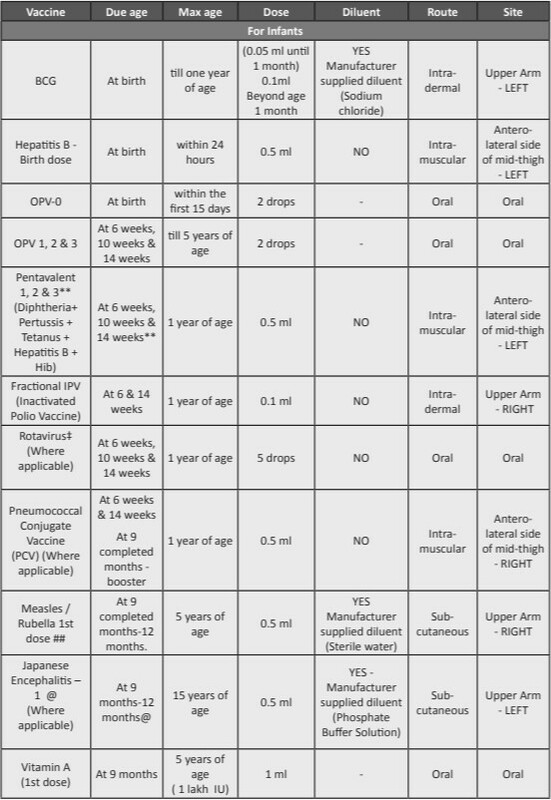 Given below are details of all vaccines included in the National Immunization Schedule. This schedule is approved by Health Ministry of India. All vaccines mentioned in the schedule are mandatory as per regulations of the Health Ministry. The first vaccine to be given soon after birth is B.C.G (Bacillus-Calmette Guerin). It acts as a protective shield against the deadly tuberculosis infection. Calmette and Guerin are the names of scientists who developed this vaccine. It is injected into the skin of the left forearm on the outer side only. It is advisable to administer BCG within the first few hours of the child’s birth. Along with BCG injection, the first oral dose of polio vaccine and first injection of Hepatitis B, are also administered at birth. Hepatitis B injection is administered on the muscles of thigh only and at no other site. Local swelling and redness at the site of injection is the most common complication of both the injectable vaccines. These symptoms subside within no time. The second vaccination after B.C.G, polio dose, and hepatitis B injection, is given at 6 weeks of age. The first dose of injectable pentavalent vaccine is given when the baby turns 6 weeks old / 1 and a half months old. The five diseases against which this vaccine offers protection include Diphtheria, Whooping Cough, Tetanus, Hepatitis B, and Influenza. All of these are infectious disorders caused by deadly virus and bacteria. Except Hepatitis B and Tetanus, the other 3 disorders are highly contagious. Their contagious nature makes is difficult to contain them and therefore, it is important to vaccinate infants against these diseases. The first dose of injectable polio vaccine is also given along with pentavalent vaccine. It is mandatory to administer Pentavalent and Polio vaccines to all children once they turn 6 weeks old. In some States of India, it is also mandatory to administer rotavirus vaccine. This vaccine offers protection against viral diarrhoea which can have a strenuous effect on the infant’s health. A dose of pentavalent vaccine is repeated before the child turns 3 months old. This is known as a booster dose as it enhances the effect of a vaccine which has been previously administered. Infants who have received the first dose of rotavirus vaccine, need to be given a booster dose for the same. Once the baby turns 3 months old, another dose of Pentavalent vaccine is given. 2nd booster dose of rotavirus is given along with Pentavalent vaccine to those children who have received previous doses. The first booster dose of injectable polio vaccine is mentioned in the immunization schedule at the age of 14 weeks. Most injectable vaccines lead to swelling and pain at the site of injection. Children may suffer from temporary discomfort due to this. However, these symptoms subside with time and do not cause any long lasting health issues. Children are given vaccination against infections like, Measles, Mumps, Rubella and Japanese Encephalitis for the first time when they are nearing one year of age. Both vaccinations are administered in the form of subcutaneous injections. Japanese encephalitis is mandatory only in regions where the condition is endemic. Children of this age group are given the first oral dose of Vitamin A in order to avoid deficiency of this particular nutrient. Despite this supplement, parents should ensure that they include foods rich in Vitamin A in their children’s diet. Consuming foods that are naturally rich in Vitamin A, is a better way of avoiding Vitamin A deficiency. By the time a child turns 1 year old, he/she has been administered with all the vaccines mentioned in the national immunization schedule at least once. From 1 year of age till 18 years of age, repeated doses of these vaccines are administered. They serve as booster doses which enhance the action of previously given doses of the same vaccine. Booster doses of Japanese Encephalitis vaccine are given only to those children who have been given the first dose of the vaccine. 3 out of the five vaccines included in the pentavalent vaccine are repeated before the child turns 2 years old. These vaccines are combined into a single injectable dose known as D.P.T (Diphtheria, Pertussis, Tetanus). It is an intramuscular injection administered into the thigh. 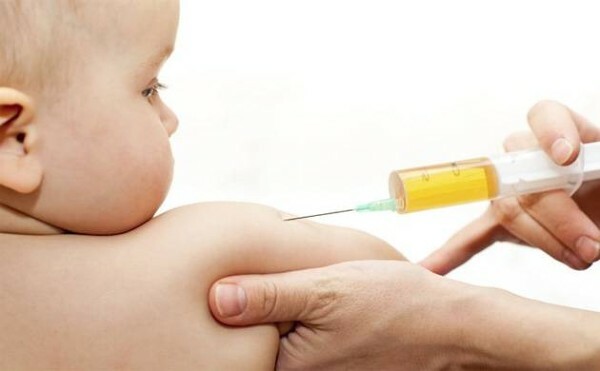 Some toddlers may experience fever, pain and discomfort after the vaccine. A booster dose of oral polio vaccine is also given to children of this age group. Another booster dose administered during this period includes injectable vaccine of M.M.R (Mumps, Measles, Rubella). Children staying in endemic regions are also vaccinated against Japanese Encephalitis. The first booster dose of Vitamin A is to be given orally before the child turns 2 years old. Along with this oral dose, children should also receive a healthy diet that is rich in Vitamin A. From the age of 2-5 years, children are to be administered with booster doses of Vitamin A supplement. The dose is administered every 6 months in oral form. Vaccination continues till the age of 18 years. It primarily comprises of booster doses of tetanus vaccine, diphtheria vaccine and measles vaccine. Due to advancement in medical research, newer vaccines are tested and introduced into the market every year. Teenage females can now be vaccinated during their childhood so that they do not get affected with life threatening infections like measles later during their pregnancy. Many people argue that children should be allowed to develop their immunity naturally without vaccinating them. While this is true to some extent, one simply cannot risk exposing infants and young children to infections as serious as Japanese Encephalitis or measles. Simple viral flu, seasonal cold and cough, do not require vaccination and in fact help children in building a healthier immunity. However, the same cannot be said about infections that can have fatal outcome. A debate on pros and cons of vaccination has stirred up a lot of controversies lately. While some parents prefer to stick to the old school ideology of vaccinating their children, some parents have started taking the ‘no vaccination’ approach. There is adequate research to support the usefulness of vaccinating children. However, research on the disadvantages of vaccination is still in a nascent stage. Therefore, not much tangible proof exists on the adverse effects of vaccination. It is unwise to reach a decision of vaccinating or not vaccinating young children without consulting with a pediatrician.